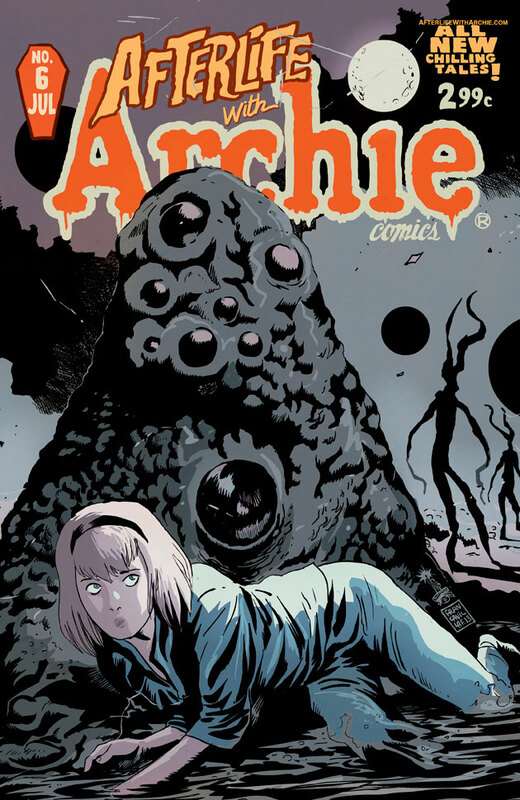 I thought I knew what was going to happen in Afterlife With Archie. I was wrong. This book has completely flipped itself on its head. What had started as a simple, character driven zombie apocalypse story has now become so much more. And I can't wait for the next issue. This issue is completely Sabrina focused. You won't find Archie or the rest of the gang here. It does a great job of setting up the new Sabrina series that will be coming out soon (even including a nice, creepy little prologue at the end of the book). It also does a great job of incorporating everything I love about horror into one issue. This book reads like The Twilight Zone, Lovecraft, and Rosemary's Baby all rolled up into one. A creeping sense of dread is constantly built throughout and never lets go. This tension and horror builds to a cataclysmic finale, and honestly one of the best monologues I've ever read. Kudos to you, Roberto Aguirre-Sacasa. But even with such a strong writer, this book just wouldn't be the same without the modern master of horror comics art, Franceso Francavilla. His colors emote so much on the page that it's hard to describe. Fear, dread, love, it's all there on the page. If you thought the first arc was special, then you haven't seen anything yet. We're in for an epic adventure.